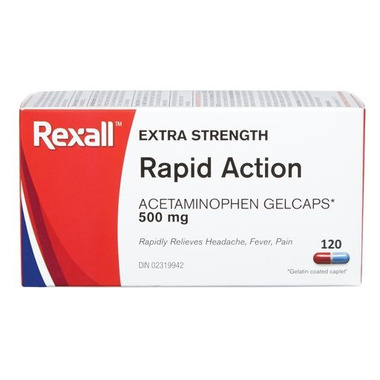 The Rexall Extra Strength Rapid Action Acetaminophen gelcaps rapidly relive fever, headache and pain. Caution: Do not give to children under 12 years of age. Adults (12 years and older): 1 gelcap every 4 - 6 hours. If pain or fever does not respond to 1 gelcap, take 2 at next dose. Do not exceed 8 gelcaps daily. This product is not a standard dosage unit product.